With advocacy running through my veins, one would Parkinson's Action Network (PAN) or, at the very least, committed to following up on the group's "Action Alerts." Neither was the case, however. I didn't believe my phone call or email could change my Congressperson's mind on major issues (e.g. stem cell research) in the Parkinson's community. Instead, I try to elicit change by appealing to the court of public opinion through my letters to the editor. Then I listened to Jean extol the ease of taking action on "Action Alerts" and the potential number of voters' voices PAN could bring to bear on Congress if more people with Parkinson's and their families and friends took a few minutes to participate in the democratic process. When the next Action Alert arrived in my inbox, I called my Congressman and urged him to vote to override President Bush's veto of an appropriations bill that included funding for the National Institutes of Health. A week later, he sent me a letter explaining that while he voted to override the veto, the House failed to gain the necessary 2/3 majority vote to do so. Although I would have preferred a different outcome, the experience renewed my faith in the Democratic process. I had made contact with my Congressman, shared my feelings about specific legislation with him, and got his feedback. If you want to try on the role of advocate with virtually no learning curve or time commitment, look to the Parkinson's Action Network (PAN), which lobbies Congress on behalf of all people with Parkinson's (PWP). It has a staff of 10 in Washington, D.C., but its strength lies in the 160 grassroots volunteers from 41 states who work to make the public and lawmakers aware about the effects of PD. 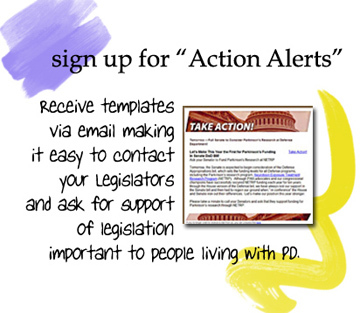 Sign up to receive PAN's email "Action Alerts" (generally two or three per month) when important legislation is pending in Congress. You will be asked to "Take Action" and contact your Congress person to ask for their support of a specific bill. PAN makes writing to your legislators quick and easy by providing an automated process with a template to send emails or letters. You can use the template "as is" or personalize it. Currently, too few people are signed up to receive "Action Alerts." Imagine what a powerful voice we would have even if only 10% of the 1.5 million PWP, plus their friends and families, made their desires known on "the hill" using PAN templates. We would be a force with which to be reckoned.